When the line goes down and production stops, time is money. Whatever broke must be root caused quickly, and a replacement coupling must be secured as quickly as possible. 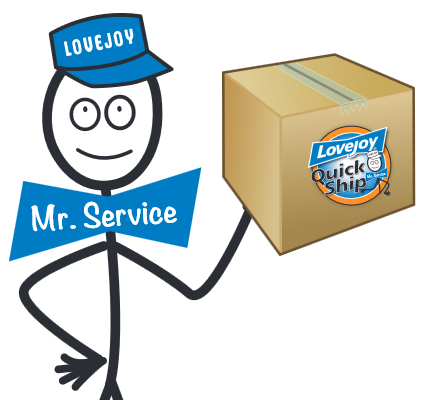 Specific to couplings, Lovejoy's application engineering department is acutely aware of how important speed of service is in such situations, and has developed a Quick Ship program exclusively to help take care of breakdown customers as soon as possible. So what exactly does the Quick Ship program look like, and how will it ensure I receive my coupling quickly? One core principle of QRM is the concept of elasticity of demand, which basically states that for a factory with high mix to run effectively... there must be an ability to absorb peak demands without wreaking havoc. (For a more complete overview of QRM, check out either the University of Wisconsin link posted above or this Wikipedia article.) A common analogy or example to demonstrate this principle is an interstate during rush hour. Orders do not always (or often) come in predictably, so a company must be able to flex as peak loads hit without creating gridlock. Lovejoy provides customers, and specifically Quick Ship customers, elasticity of demand by having three dedicated finishing work cells set aside for the unexpected Quick Ship. Customer service owns these work cells, and the shop floor and Lovejoy's scheduling department do not schedule these cells. When a call from a distributor comes in, Lovejoy's customer service team will quickly qualify the Quick Ship (ensuring it meets the criteria of the program inclusive of limited quantity and raw parts on hand). Once qualified, the Quick Ship order is printed directly to the Quick Ship cell. Upon completion, Quick Ship orders are immediately taken down and put on a bright red cart in front of Lovejoy's shipping/distribution department to ensure the order is promptly boxed and queued for carrier pickup. Quick Ship sounds great, but what are my next steps? This may sound obvious, but the first think you want to do is to understand what went wrong with the original application. Did the original coupling wear out due to normal wear, or was something more troublesome going on (misalignment, peak torques, chemical exposure, undersized coupling, etc.). If you have no idea, please feel free to give us a call or read some more articles on this blog to better educate yourself... as we really don't want to see you repeat or not correct a mistake or issue that may exist with your given application. Note: Quick Ship orders need to be placed over the phone by the distributor to Lovejoy. As soon as your trusted distributor does this, they will be able to give you the promised lead time and cost for the coupling or product in question. At this point, your order will already be in route or in the hands of a Lovejoy operator ready to fight the good fight to get you up and running in the shortest possible time period. And what if it wasn't the coupling that failed? Lovejoy is, at its heart and soul, a coupling company... and, while we wish we could help you with your bearing, pump, motor, etc. failure... there is a much better resource to lean on: your trusted mechanical power transmission distributor. These guys (and ladies) know the industry inside and out, and they know which manufacturers they can trust and lean on to get a product out fast. If you don't yet have a relationship with a linchpin distributor you trust, we recommend you start by searching for one here (which even allows you to search by zip code for those of you living in the United States or Canada). To reference the Aesop's famous fable of The Boy Who Cried Wolf, if the replacement part need isn't an emergency, please be truthful about your time requirements when working with your trusted distributor partner. While not always the case, time can and does often mean more money (even if it is only in the expedited shipping fees) and does take a bit more work on the distributors part. Almost always rush orders require automated processes (placing and managing orders with manufacturers online) being turned into manual ones (phone orders and more manual tracking). Please be respectful of your distributor's time, your own wallet (or your company's wallet), and allow the emergency lane to remain open to those in most urgent need.